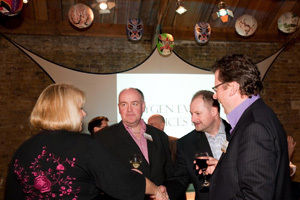 This month's ISES networking event was held The Hub in Kings Cross last night (23 March) and Event has a selection of pictures. Ttitled Greener Times the educational and networking event saw speakers including Grass Roots marketing director Aileen Reuter, Jamie Grainger-Smith from "Think, Eat, Drink", and The Hub's Eleanor Whitley. Guests got to enjoy food from Think, Eat, Drink, while other suppliers included Oxygen Events, Stellar Winery, Aubert & Mascoli, Thorns, Off to Work and BIG. To see photos of the event courtesy of Georgina Cranston click here. To comment register and let us know your thoughts.